This week for a cooking club challenge is the Ancient grains theme featuring Ellie Krieger and with so many grains on and off the list to choose from I kind of took off on my own deciding to make a fregola which is a semolina product similar to couscous, but far superior. A toasted nutty flavor that you can enjoy numerous ways as you would a quinoa, couscous or farro piccolo. I order all of my grains from Anson Mills every few months and keep them stored in the freezer…I love their Antebellum grits and farro just to name a few, but I always have on hand Carolina Gold rice as well as several other products. A fabulous story behind Anson Mills and anyone that appreciates grains would not be disappointed in their products. Link below. In a sauté pan, sauté the onion, garlic in a tablespoon or so of EVOO over medium heat. Add the fregola parsley, basil leaves and pepper flakes, stir to toast a bit and add 1 cup of the broth and simmer for 7 minutes or until most of the liquid is absorbed then add the tomatoes and basil paste. Test a grain or two and if you need more broth add another cup. Stir, season with salt, pepper and cover the pan. I like to add the tomatoes for just the last few minutes of cooking time or until they just pop open and not melt down to nothing in the sauce. 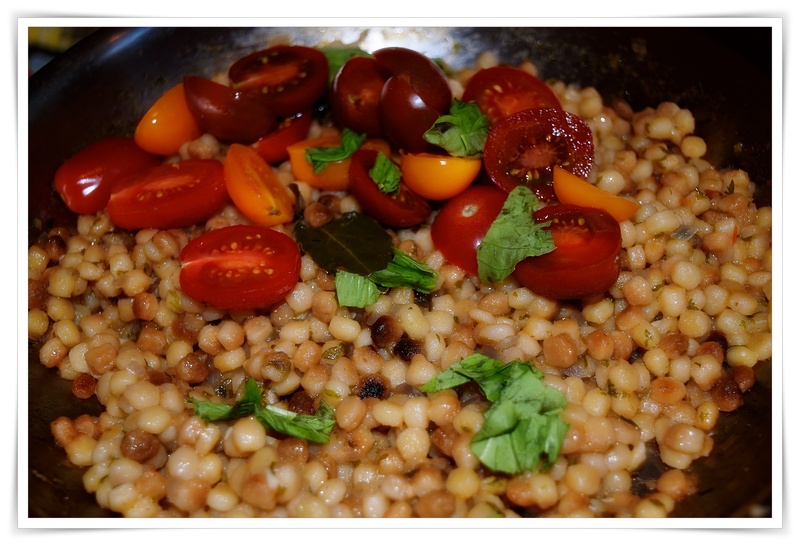 Reduce heat to low, let the fregola simmer until slightly al dente. To finish place fregola into a serving dish, add in the remaining parsley, basil leaves, drizzle with a little EVOO and sprinkle cheese over. Transfer to a platter, and add the torn basil leaves, a drizzle of Extra Virgin olive oil, and a few turns of freshly ground black pepper. Serve with shredded pecorino or blend of cheeses.